This paper describes the adaptation of protein destabilizing domains (DD), transcriptional activation domains, and catalytically deficient Cas9 (dCas) to create a complex that can be used to dial gene transcription up or down. The construct involves fusing the bacteriophage protein coat protein PP7, which binds a RNA stem-loop structure to both a DD (in this case either the unstable proteins DHFR or the estrogen receptor) and the VP16-based transcriptional activation domain. In the absence of ligand, the DD is largely unfolded and targets the entire fusion protein to proteasomal degradation. The addition of a ligand such as trimethoprim stabilizes the DHFR DD and prevents degradation. The second part of the system employs guide RNAs (gRNA) that incorporate the PP7 RNA binding sequence and the dCas9 protein. Therefore, once stabilized, the PP7 fusion protein binds to the gRNA, and the targeted promoter is then activated by the transcriptional activator domain. Removing the ligand efficiently shuts down gene transcription. Furthermore, depending on the concentration of ligand chosen, different amounts of transcription can be obtained. The paper also shows that inducible chemical control of nuclease activity can be achieved by fusing DD domains to both the N- and C-terminus of a catalytically active Cas9. In this way the editing activity of Cas9 can be controlled and limiting this activity to a short timeframe should reduce off-target effects. Contributed by Doug Auld. Multidimensional “chemical” control of endogenous transcript levels. (a) Top, small-molecule-mediated transcription induction via a destabilized domain-fused transcription activation domain (DHFR.PP7.VP64), dSpCas9, and an sgRNA. Bottom, HEK293T cells transfected with dSpCas9 and an RFP control, PP7.VP64, or TMP-regulated DHFR.PP7.VP64 targeted to IL1RN were treated with 10 μM TMP for 18 h before qPCR analysis. (b) Rapid turn-off of transcription. Cells were transfected and treated with 100 nM TMP to upregulate endogenous IL1RN(additional biological replicates are shown in Supplementary Fig. 3) or NANOG. After 18 h of TMP treatment, cells were provided with fresh media containing or lacking TMP before harvesting and analysis by qPCR. (c) Independent, small-molecule-mediated control of transcript expression for two genes in cells expressing dSpCas9 and two orthogonal destabilized domain-regulated transcription activation domains. DHFR.PP7.VP64 was targeted to IL1RN, and ER50.MS2.p65.HSF1 was targeted to ASCL1. Transfected cells were treated as indicated (TMP, 100 nM; 4OHT, 10 nM) for 18 h before qPCRanalysis. (d) Highly dose-responsive endogenous gene upregulation in cells transfected with dSpCas9, appropriate sgRNAs, and either DHFR.PP7.VP64 (left) or ER50.MS2.p65.HSF1(right) targeted to IL1RN or ASCL1, respectively. Transfected cells were treated with increasing concentrations of TMP or 4OHT for 18 h before qPCRanalysis. Error bars represent ±s.e.m. from biological replicates (n = 3; a,c) or ±s.d. across technical replicates (n = 4; b,d). Cas9-based technologies have transformed genome engineering and the interrogation of genomic functions, but methods to control such technologies across numerous dimensions—including dose, time, specificity, and mutually exclusive modulation of multiple genes—are still lacking. 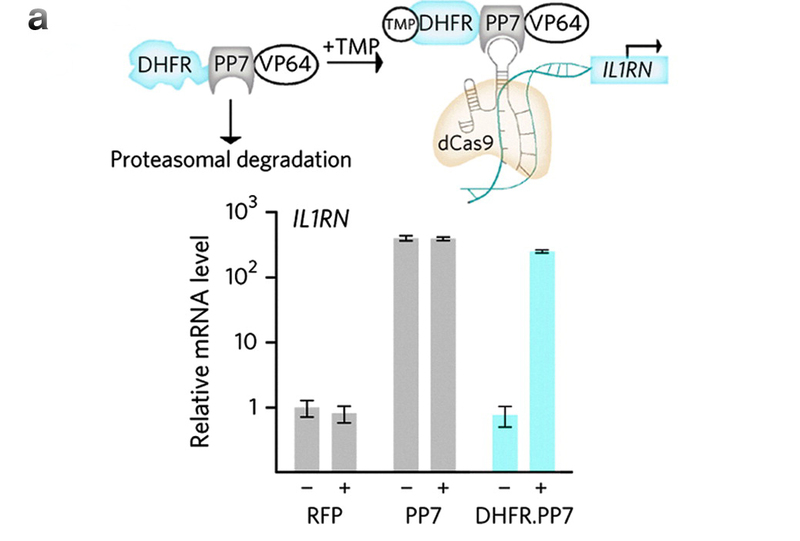 We conferred such multidimensional controls to diverse Cas9 systems by leveraging small-molecule-regulated protein degron domains. Application of our strategy to both Cas9-mediated genome editing and transcriptional activities opens new avenues for systematic genome interrogation.